Enlarged or swollen lymph nodes are most commonly found in the neck, including the sides of the neck, front of the neck, and at the back of the neck behind the ears. Swollen lymph nodes can also appear in the armpits, under the chin, and in the groin area. You can also find large groups of enlarged lymph nodes in the abdomen and chest area. What Causes Swollen Lymph Nodes on the Neck? Fungal diseases: Including histoplasmosis and coccidioidomycosis. Lymphoma and leukemia: Chronic or acute lymphocytic leukemia derives from cancerous cells in the bone marrow. Lymphomas, on the other hand, will develop in the lymph nodes or other lymphatic tissue within the body. Both cancer types will cause swollen lymph nodes, including nodes in the neck. That being said, the swelling with lymphoma and leukemia is often painless. These types of nodes can also be classified as hard and firm rather than a consistency that is normal and rubbery. Tonsillitis: Tonsillitis, or tonsil inflammation, is another infection that leads to swollen lymph nodes in the neck. This is due to the tonsils being a key part of the immune system. Various bacteria and viruses can cause tonsillitis, which include Streptococcus pyogenes, herpes simplex virus, Epstein-Barr virus, cytomegalovirus, and adenovirus. Other common symptoms of tonsillitis include enlarged tonsils, a raspy voice, a fever, painful swallowing, and foul-smelling breath. 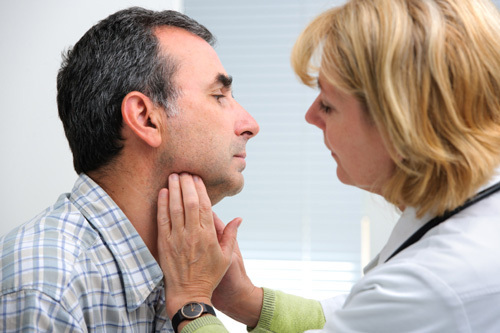 Throat infection: A throat infection, or pharyngitis, is another cause of swollen lymph nodes in the neck. Mildly tender or painless swollen lymph nodes are common with viral pharyngitis. Most bacterial throat infections are often due to a type of pharyngitis called strep throat—caused by group A Streptococcus bacteria. Symptoms typical of a strep throat include swollen and tender lymph nodes in the neck, a sore throat, difficulty swallowing, appetite loss, headache, chills, and a fever. How can you tell if you have a swollen lymph node in the neck? Swollen lymph nodes can appear as small as a pea or as large as a cherry. For instance, lymph nodes may be normal if they are less than a centimeter in size. However, when they swell, they will double or triple in size to the point where they can be felt. What are other symptoms related to swollen lymph nodes glands? Swollen lymph nodes glands may get smaller without treatment. Other times treatment is required. If this is the case, treatment for lymph nodes in the neck will depend on the cause of the symptom. For example, if cancer is thought to be the cause of the swollen lymph node in the neck, a biopsy will help confirm the diagnosis. If the cause is viral or bacterial, antiviral medications or antibiotics may be prescribed to eliminate the swollen lymph nodes. From a holistic standpoint, there are also natural remedies that can be given for swollen lymph nodes. Homeopathic remedies: Homeopathy can help treat swollen nodes glands such as Mercurius solubilis, Kali muriaticum, Natrum muriaticum, belladonna, iodine, silicea, Calcarea fluorica, bromine, Calcarea carbonica, and Ferrum phosphoricum. Homeopathic tincture will also help drain the lymphatic system and trigger an immune response. Consult a homeopath for the best remedy based on your symptoms. Apple cider vinegar: You may also be able to treat swollen lymph nodes in neck with apple cider vinegar. It’s used to treat infections due to its antibacterial properties. To potentially treat swollen lymph nodes, combine apple cider vinegar with filtered water, soak a cloth with the mixture, and place it on your swollen lymph nodes on your neck. After five minutes, rinse the affected area and let it dry. Repeat this two to three times daily. Honey: Honey may also treat swollen lymph nodes in neck due to its antibacterial and antiviral properties. Consume at least two teaspoons of raw, organic honey twice daily, or a teaspoon of honey in a glass of water daily. You can also apply raw honey on your swollen lymph nodes. Wash off the honey after 15 minutes, and use this technique twice daily. Salt water: Another possible way to treat swollen lymph nodes in neck is to try gargling salt water to reduce swelling and inflammation in your neck and throat lymph nodes caused from infections. Add a half-teaspoon of coarse sea salt to a glass of warm water. Gargle this mixture a few times daily for up to a week. There are also certain lifestyle changes and other natural treatments that can help manage swollen lymph nodes. What are other ways to manage swollen lymph nodes on neck? Warm compress: A warm compress improves blood circulation and therefore reduces pain and swelling associated with swollen lymph nodes. Soak a washcloth in hot water, wring it out, and place it over swollen lymph nodes for around 10 minutes. Apply a warm or wet compress to your affected area several times per day. Exercise: It is also a good idea to exercise at least five days each week for 30 minutes a day. Exercise will increase the flow of the lymphatic system. Examples of exercises for swollen lymph nodes include walking or light jogging. Walking briskly or jogging for 30 minutes daily will warm the entire muscular system. Afterwards, sit in a chair or stand up with a straight back. Making time for natural stress-relieving treatments such as yoga and massage therapy may also help reducing the swelling of your neck lymph nodes. The power of yoga is quite incredible. It is a meditative, mind-body movement that is rooted back to ancient India. Some of the most popular yoga variations include Bikram, Iyengar, Astanga, and Vinyasa, which all stem from Hatha yoga. Yoga is a great practice for those with swollen lymph nodes in the neck. Inverted poses with the head below your heart will allow you to decrease swelling and strengthen the lymph nodes in your neck. Among these inverted postures include a standing forward bend (uttanasana), downward-facing dog (adho mukha svanasana), and a lion pose (naukasana). Regular massage sessions can help reduce swollen lymph nodes and swelling. Another option is to gently massage your lymph nodes daily for about 15 minutes. This will stimulate the lymph nodes to improve lymphatic function. You can also massage your swollen lymph glands with carrier oils like jojoba, sweet almond, oregano, and eucalyptus oil to help excrete flow and decrease inflammation. There are particular guidelines follow as you massage swollen lymph nodes to help prevent any harm to the body. In general, slow movements and light pressure are best to help stimulate the lymphatic vessels below the skin. As a result, normal self-massage will not work. Rather, your pressure on the lymph node should mimic the pulse and rhythm of the lymphatic system. The pressure should be performed in a downward motion to encourage the outflow of waste and fluid. Step 1: With gentle pressure, apply the fingertips on the upper edge to middle of the collarbone for about three seconds. Apply the stretch five times with a pause of about three seconds in between each pressure. Step 2: Next, you will massage the trapezius—a triangular muscle at the back of the neck and shoulders. Place your fingers at the trapezius, stretch the skin toward your outer shoulders, and then press forward in a spiral motion. The motion will take about three seconds. Afterward, remove pressure completely for three seconds before repeating the entire step five times. Step 3: The third step has you hug your neck with your fingers in a “butterfly wing “position. Make sure your fingers cover only the neck, while your hands do not touch the neck. Apply a very gentle pressure on the ears and downward to the collarbone. Apply pressure for three seconds, and repeat five times with a three-second pause in between pressure. Step 4: Place your fingers on sides of your neck and gently stretch the skin, and move downward toward the collarbone. Again, do this for three seconds and repeat five times. Step 5: Place two fingers behind the ear lobe and stretch the skin directly downward to one-inch in length. Again, stretch for three seconds five times, with three-second pauses in between motions. If performed correctly, all lymph nodes will likely open up. To complete the lymphatic neck massage these steps must also be performed in reverse movement to encourage fluid flow to the collarbone. Drink lots of clean, filtered water to help rid the body of toxin buildup. Ensure pressure is soft and gentle for the most positive results. A light stretch is necessary as it helps to manually pump the lymphatic vessels. Stretch the skin in a direction where the lymph nodes flow. The stretch should always be applied for three seconds, before pausing for three seconds and then repeating the step. Cunha, J., ‘Swollen Lymph Nodes,” EMedicine Health; https://www.emedicinehealth.com/swollen_lymph_glands/article_em.htm, last accessed Feb. 12, 2018. St. John, T., “Causes of Swollen Throat Glands,” LIVESTRONG.com; https://www.livestrong.com/article/131697-causes-swollen-throat-glands/, last updated Aug. 14, 2017. Higuera, V., “Strep Throat,” healthline, July 3, 2012; https://www.healthline.com/health/strep-throat, last accessed Feb. 12, 2018. “32 Home Remedies For Swollen Lymph Nodes in Neck and Throat,” True Remedies, April 5, 2017; https://trueremedies.com/home-remedies-for-swollen-lymph-nodes/. “Benefits of Yoga: Which Type Fits Your Personality?” Dr. Axe; https://draxe.com/benefits-of-yoga/, last accessed Feb. 12, 2018. Little, T., “A Yoga Sequence to Keep You Healthy this Winter,” Yoga Journal, Nov. 12, 2015; https://www.yogajournal.com/practice/yoga-sequence-keep-healthy-winter#gid=ci0207568e400d2620&pid=home_277_05_fnl-tias-little.